Never pay for your vacation rental by wire transfer. Learn more about paying safely. You will find "Bountiful” true to the name, offering abundant relaxation and generous care for your enjoyment at Sandbridge Beach. The exterior has been designed with neat landscaping to invite you to use the great outdoors as additional living space! Inside you are welcomed with cute, beachy touches in a great price for your family vacation at the beach. There is plenty of seating in the great room for relaxing in the cool living area for an update on the big game, some will spend all their time on the screened porch turned "Island Bar”, and the kids can hang out under the house swinging in the hammock. "Bountiful” offers a nice grilling area with gas grill, and the convenient picnic table offers plenty of meals "al fresco”. The ground level half bath plus the nice outdoor shower give you addiitonal bathroom options for active families on the beach all day! This is the beach cottage that will allow you to enjoy the fresh ocean breeze and a short walk for long, lazy days on the beach. All day on the beach, all night at the Island Bar! What more could you want? Located at the quiet north end, a great place to recharge and refresh your family memory bank! Ground-Level: Foyer, Washer/Dryer, Half Bathroom, Outdoor Area, Gas Grill, Picnic Table, Hammock. Fireplace seen in photos is non-functioning and not available for use. You will find "Bountiful” true to the name, offering abundant relaxation and generous care for your enjoyment at Sandbridge Beach. The exterior has been designed with neat landscaping to invite you to use the great outdoors as additional living space! Inside you are welcomed with cute, beachy touches in a great price for your family vacation at the beach. There is plenty of seating in the great room for relaxing in the cool living area for an update on the big game, some will spend all their time on the screened porch turned "Island Bar”, and the kids can hang out under the house swinging in the hammock. "Bountiful” offers a nice grilling area with gas grill, and the convenient picnic table offers plenty of meals "al fresco”. The ground level half bath plus the nice outdoor shower give you addiitonal bathroom options for active families on the beach all day! This is the beach cottage that will allow you to enjoy the fresh ocean breeze and a short walk for long, lazy days on the beach. All day on the beach, all night at the Island Bar! What more could you want? Located at the quiet north end, a great place to recharge and refresh your family memory bank! Top-Level: Great Room with LCD TV, Sleeper Sofa, Kitchen, Bar seats 4, Dining Table seats 8 chairs, Screened Porch with Bar and 2 Tables and tiki bar, Two Hall Bathrooms, King Bedroom with LCD TV; Queen Bedroom with LCD TV; Bedroom with Bunk Bed and a Twin; Bedroom with Bunk Bed and a Twin Ground-Level: Foyer, Washer/Dryer, Half Bathroom, Outdoor Area, Gas Grill, Picnic Table, Hammock. 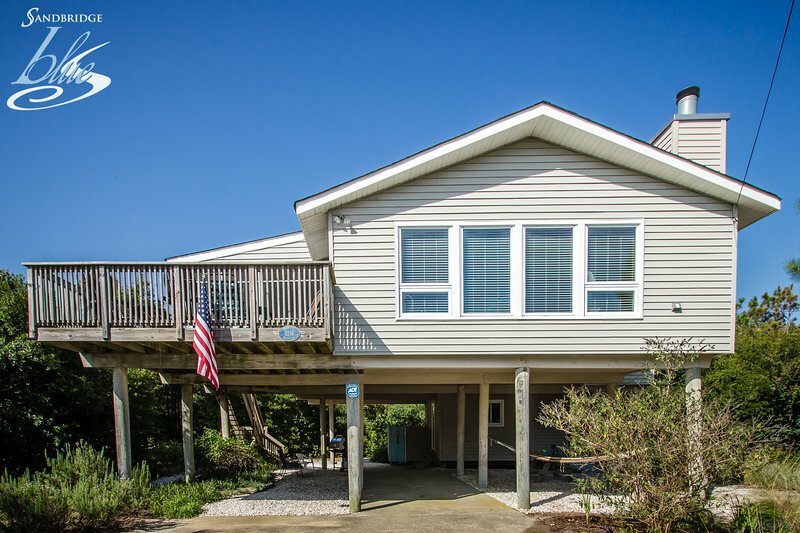 Extras: Wireless Internet Access, DVD player, Gas Grill, Screened Porch, No Smoking, Dogs Allowed, Parking: 4 Cars, Distance to the Beach: 1140 ft Additional amenity details: Fireplace seen in photos is non-functioning and not available for use. All Sandbridge Blue properties provide bed linens, bath towels, beds made prior to your arrival, and a starter supply of: toilet paper, bathroom soap, paper towels, and dishwater detergent.